A brand new direction for Spyro the Dragon. Skylanders sees Spyro introduced to a whole new universe of characters and real world toys that are used as part of the game. Skylanders Spyro's Adventure lets kids take on the role of a powerful Portal Master, who can control over 30 different characters, including the beloved purple dragon Spyro. Each of these heroes is a protector of an amazing, mysterious world, but they have been ejected from their world by the sinister Portal Master known as Kaos and now they are frozen in our world as toys. Only the players of Skylanders Spyro's Adventure can get them back into their world, by embarking on a fantastical journey where they will explore mythical lands, battle menacing, outlandish creatures, collect treasures, and solve challenging puzzles as a part of the quest to save their world. Instead of just playing as Spyro you will have a wide selection of 32 characters to choose from, each of these unique in their own way. The toys themselves store information inside that relates to your ingame character's progress and levelling to make it simple to use on another's system. Here are all 32 of the characters, some have multiple forms but they only count as one of the 32. In the United States the individual single pack toys were priced at $7.99 each, and there are also larger packs containing three characters. With the console and PC Starter Packs you get your first three "interaction figures" to start you off; Spyro, Trigger Happy, and Gill Grunt. In the 3DS Starter Pack you instead get Ignitor, Stealth Elf and Dark Spyro, an exclusive character. As well as the 37 different recognised toys there are also rare variations of some characters. In-game these do not have a different appearance to their normally painted counterparts so other than the toy's coat of paint they are exactly the same. The current confirmed variations are Silver Boomer, Silver Eruptor, Silver Dino-Rang, Gold Drill Sergeant, Gold Flameslinger, and Gold Chop Chop. There are also two even rarer Skylanders that were only made available at retail events; Metalic Purple Cynder and Pearl Hex. Not all of the characters were released at launch, they have been put out in gradual waves containing new characters and adventure packs every few months, with several still waiting for release. The characters of Skylanders will each have one of eight elements, these are shown by the type of base their toy has. There are some enemies that are weak to certain elements but this is not a widespread feature, the main use in-game for the different elements is to unlock extra parts of each level. The levels are also broken down into sections where a specific element has its Elemental Power bonus active. To bring your toys into the game you'll need the included Portal of Power, you simply place the toy in the centre of the Portal and instantly the character you've used will appear in-game. This circular device glows different colours and has the ability to recognise two characters placed on it at once to allow for multiplayer co-op or PvP battles. The Xbox 360 and PC Portals are wired and just plug straight into the console/computer, no batteries required. The PS3 and Wii Portals are wireless and require three AA batteries, they come with a small adaptor that plugs into a USB port on the console. The 3DS portal is also wireless and is powered by three AAA batteries. Your first set of batteries are included of course. The only portal that works with the Xbox 360 is the portal that comes with the Xbox 360 and the Xbox 360 portal will only work with the Xbox 360 version of the game (and the web game). Due to its unique method of infra-red communication with the 3DS, the 3DS portal is the only one that will work with the 3DS game. However the 3DS portal can work with the PS3, Wii and PC versions of the game, simply connect it to your system using the included USB cable. This cable also allows you to use your 3DS portal with the web game. Despite its smaller size, when connected to a console it functions exactly like the larger portals in regards to the number of Skylanders and Magic Items it can read at the same time. As well as the physical plastic toy you receive a trading card with a picture of the Skylander and some stats. The stats on these cards do not appear to have any relation to their in-game stats. There are no official rules for games using the cards. As well as all of the different characters you can supplement the game with the four Adventure Packs. These contain a Skylander that is unique to the pack, two small Magic Item toys that will help during your game, and a larger Adventure Item that unlocks a brand new level in the game for you to complete. The game appeared on the Xbox 360, PlayStation 3, Wii, PC, and 3DS as well as on the web with Skylanders: Spyro's Universe. There is also a mobile version that has yet to be released. A pack of three Legendary Skylanders: Spyro, Bash, Chop Chop. A single pack of Legendary Trigger Happy. For first 30 days after its release: Dragon's Peak. At launch Whirlwind was exclusive, has since been more widely released. The Volcanic Vault battle arena toy, it came free with the game at launch. At launch Drill Sergeant was exclusive, has since been more widely released. First article about the game. The official website, currently has the first trailer. Toys R Us's promo page for the game. The website of the developers of Skylanders. A Kotaku article from the Toy Fair, gives the bios of a few characters. WTF??????? skoolander spoyroo looks SOOO UGLY!!! this game is a disgrace to the spoyroo franchise!! Tbh I like the Skylanders franchise more than original Spyro trilogy and especially Spyro franchise on the whole. Miss those days so much. Aching to marathon this series lately. Even though the newer Skylanders improved a lot of things wrong or missing in this game, I still love this game to death!!! 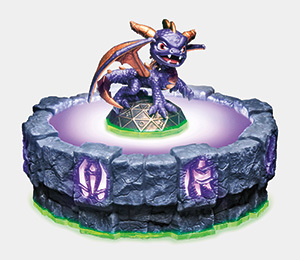 hmph, That's not spyro in skylander. I gonna not insult too much. This game brutally murdered my wallet.